PUZZLE SOLVERS : Jon Moorman, Evan Ralston, and Eriq Augustine spent 48 hours in one room designing and building their game Road to Redemption. It’s close to noon on a Saturday and three guys are huddled around a computer monitor staring at lines of code. The room is hot, the stagnant air thick with a dank smell like that of a high-school locker room. Empty Pepsi cans litter the tables. The only sounds are the dull hum of computer fans and the gentle snoring from someone who’s passed out on the floor while Jon Moorman, Evan Ralston, and Eriq Augustine concentrate on their video game: Road to Redemption. Moorman, Ralston, and Augustine haven’t slept all night. Phyllis Douglas, their artist, just left for a few hours after designing the main characters, the world, and the animations for the game. In about three hours they’ll reach the halfway point of the Global Game Jam, a 48-hour game-development marathon whose participants have one objective: building a game by the time the clock runs out. Thousands of other programmers internationally are attempting to reach the same goal. This year, the room at Cal Poly is one of just three Game Jam locations in California and the mood is upbeat. Turn the clock ahead 24 hours, and the team is still giddy, excited by the challenge. But ultimately they’ll fail to accomplish their goal. That’s OK: Everyone else will fail, too, and no one will really care. Back to the halfway mark: The three guys are clustered around a monitor in a Cal Poly computer lab. And they’re thrilled “the punk can jump,” Evan says. The ground rules: Your game must have a monk, a punk, or a skunk. The theme: deception. The timeline: 48 hours. Jon and Eriq discuss upcoming milestones and Evan is repeatedly pushing one of the keyboard buttons to make the punk jump. The move may seem trivial, but it’s a huge accomplishment for the team. There isn’t a “jump” command native to the code. To jump the character, they had to create gravity in their world and then had to simulate inertia to control how high and how far the punk jumps. Technically, the punk doesn’t move, he stays centered and the world moves around him. In other words, press right on the keyboard and the game world moves left to make it appear the punk is moving right. In this world, up is literally down and left is right. 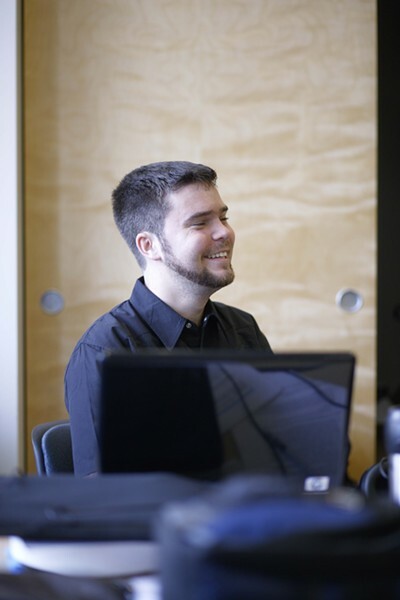 THE FOUNDER : 22-year-old Chris Gibson began the Cal Poly Game Development Club last year. He leads the club alongside Ben Issersohn and James Pearson. They all jump back to the whiteboard, which is plastered with programmers’ jargon: stage, thevo, non player, talk box. The words are in circles connected by a maze of arrows, a graphic testimony even a superficially simple game is maddeningly complex to write. Like many of the other Cal Poly students competing in the Global Game Jam, this team is learning as they program. They may be amateurs but any visitor who doesn’t understand game programming would have no clue what they’re talking about. “The NPC owns the button,” Jon responds. It’s going to be a game—for now, it’s nothing more than a puzzle. If they’re going to program a fight sequence with a drunk guy at a bar then they need collision detection between the characters. Then they realize they underestimated the amount of dialogue they need and Evan jumps back to a notebook to write more. They still have to figure out how to code the talk boxes. Though they’re trying to build a game, the end result doesn’t seem to be the reward. The real fun is the journey getting there. By the end of the 48 hours, none of the seven teams has what could be called a complete game. Everyone had bugs, one team could barely start their game, and others simply had a vision too bold to complete in such a short timeframe. And oddly, despite being sleep deprived and subsisting mostly on Pepsi and stale pizza for the past two days, everyone seems elated. All of them compete for no reason other than a shared passion to create video games. And all of them could someday carve out a slice of a roughly $20-billion industry. In 2008, the video-game industry earned $22 billion, according to the NPD Group, which tracks sales. Since 1998, the gaming market has more than tripled. By 2009 the economic recession finally caught up with gaming, but the industry was still worth about $19.7 billion. In contrast, Hollywood films last year generated a paltry $10.6 billion—a record—according to Vanity Fair. And though The Dark Knight grossed $158.3 million during its first three days, the game Call of Duty: Modern Warfare 2 spanked the entertainment industry last November, making $310 million and selling 4.7 million copies in the U.S. and UK, according to the New York Daily News. OUT COLD : James Pearson slept tucked in a corner while Jon Moorman, Evan Ralston, and Eriq Augustine approached the halfway point of the Global Game Jam. Despite the staggering sales and the fact that commercial video games have been sold for more than 30 years, the themes of the usual top sellers aren’t very sophisticated. Such hit games as Modern Warfare 2, for example, boil down to roid-raging infantrymen shooting bad guys in glitzy computer-generated environments. That may explain why games have the reputation in the entertainment industry as the metaphorical pimple-faced kid who’s obsessed with gory action flicks and big-breasted women. But there’s a new industry trend, dubbed indie gaming. The Cal Poly Game Development Club is just one example of the rise of indie gaming, which involves developers who are more interested in intriguing content than flash. Chris Gibson reluctantly admits his guilty pleasure is playing Modern Warfare 2 online. Gibson, a 22-year-old computer science major at Cal Poly, specializes in computer graphics, but he’s not the artist when it comes to games. Gibson is creating a game almost opposite in concept from his guilty pleasure—Glade—which he calls a “no-stress game.” There are no marines, no aliens, and no zombies. The player controls a malleable blob that can flatten itself out, for example, and fly through the environment. It’s his response to the mainstream game industry, in which most multi-million-dollar productions rehash the stereotypic beefcake space marine who shoots aliens and saves the world. There’s a growing market for indie game developers who want to escape the adrenaline mainline, he said. The explosion of the Internet has allowed independent developers to sell their creations directly through such services as Steam, XNA, and the iPhone App Store. But Gibson thinks the best ideas come from people who haven’t been assimilated into the games industry because “there’s not a game that breaks the mold in the mainstream industry.” Gibson is also the founder of the Cal Poly Game Development Club, which officially formed last November. Cal Poly doesn’t have a dedicated game-development program. However, a few faculty members from the computer science department are trying to change that. THE TEAM : Members of the Cal Poly Game Developers Club endured a 48-hour marathon of game design and development in January: the Global Game Jam. “It’s definitely an area that students are really excited about and interested in,” said Assistant Professor Zoe Wood. Wood is one of the key faculty members helping the club and has the personable look and character of the you-can-do-anything-you-set-your-mind-to teacher from heart-string-pulling movies. Cal Poly has a few game-emphasized courses in computer engineering, but no dedicated curriculum or degree. Wood said the goal for now is to beef up the computer science program enough to add the words “emphasis in game development.” She said the gears are turning to create such a degree and there’s a fundraising campaign to encourage alumni to donate to the school in hopes of building a new $50,000 computer lab for game design. Foaad Khosmood graduated from Cal Poly in 1999 with a degree in computer engineering. He went on to earn a master’s degree and is now rounding out a PhD at University of California Santa Cruz. He’s writing a thesis on language processing and artificial intelligence, basically “believability in artificial characters.” UCSC was the first school to create a game-development degree, Khosmood said, and other public universities have since slowly been creating their own programs, too. Out of 10 schools in the UC system, five have game programs, according to gamecareerguide.com. But of the 23 California state schools, there are only four. Cal Poly is listed as one such school because of its computer-engineering program. “A lot of students come into computer science, for example, thinking that they want to be computer scientists, but it lacks a lot of excitement for them,” Khosmood said. 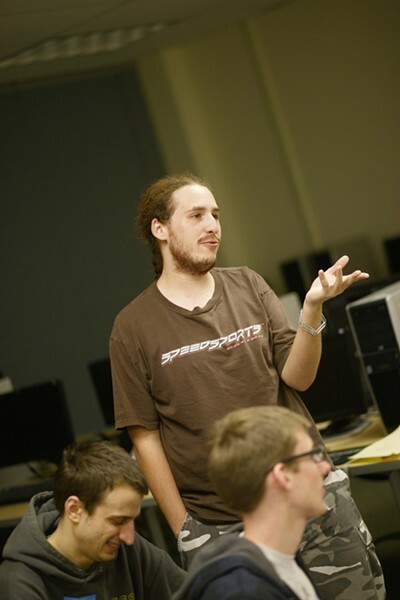 Khosmood organized the first UCSC location of the Global Game Jam in the inaugural 2009 year. This year, as part of the leadership board, he helped bring Cal Poly into the jam. Last year there were 23 participating countries and this year there were Game Jams held in 35. Despite the quick-burn development style of the Game Jam, there have been intriguing ideas, Khosmood said. There was 4 Minutes 33 Seconds of Uniqueness, based on a silent orchestral piece called Four Minutes, Thirty-Three Seconds. The game pits player versus player on a global scale and all the player can do is log in, which starts a timer. If another player logs in, the previous player’s timer stops and the new player starts clicking away in hopes of reaching four minutes 33 seconds before getting knocked out. “This sort of proves that the kind of thing that can come out of an event like Global Game Jam can be really ground breaking even though you’re lacking a lot of the big tools,” Khosmood said. 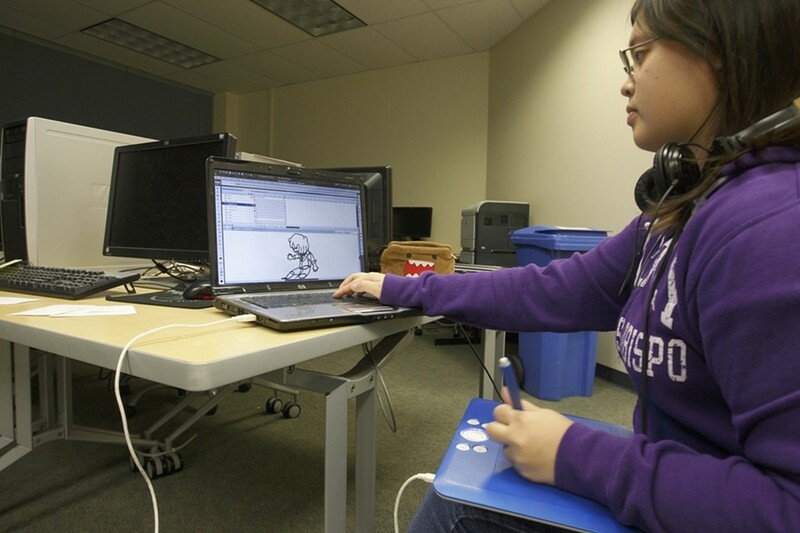 GAMES AS ART : Cal Poly student Phyllis Douglas was one of the few artists available at the Global Game Jam. Part of the problem with game design as taught at Cal Poly and other universities is the emphasis on the computer science without attention to artistic creativity. Wood said the school is pushing to have its game-design students take liberal arts courses, as well. At the University of Southern California, Michael Zyda, director of the school’s GamePipe program and a professor of engineering, believes the demand for computer-science students with knowledge of design is changing the way schools form their curricula. “Unfortunately, the kind of computer scientist required by the game industry is not exactly what traditional computer science departments produce,” Zyda wrote in the December 2009 issue of Communications of the ACM. There’s a myriad of avenues barely explored by games, Khosmood thinks. And the industry is increasingly drawing in other sectors of the academic world. Philosophy, psychology, art, and mathematics: all are needed in good game design. There’s even a discipline called game studies, which tries to break down what games actually are. “And these people found that games are a very integral part of life and everybody plays them on a daily basis, even though they don’t always call them games,” Khosmood said. He added that the average gamer is 35 years old and 25 percent of the demographic is over 50. Still, the big sellers tend to rely on flashy graphics and embellished stereotypes. Khosmood regrets that processing power devoted to artificial intelligence and smart design is often eroded in favor of big graphics. Such games as Madden NFL are typical. According to Gibson, simply retooling the mainstream games every year into slightly prettier versions pulls in oceans of cash. “Compared to a lot of indie games, they’re absolutely cookie cutter,” Gibson said. Madden NFL, for example, sold a yearly average of 4.63 million copies in the U.S. between 2004 and 2008, according to the NPD Group. But such games may have been the impetus for indie gaming and a new way of looking at the medium. “The big game industry is bereft of new ideas and risk averse,” Zyda told New Times. About 20 people, mostly male, were scattered around a small amphitheater-style lecture hall in Cal Poly. It was one of the first meetings of the Cal Poly Game Development Club and clearly the members weren’t all that sure of each other. A few sat together, but most were individually pecking at their laptops. GET GAMING: To play games from the Cal Poly Global Game Jam, go to globalgamejam.org/sites/calpoly/games. Keep track of the Cal Poly Game Development Club’s progress at cpgd.org. Gibson led the meeting. He’s a clever, articulate person though a fantastic bullshitter. In an interview a few months after that early club meeting, Gibson admitted he didn’t know much about pitching games to major studios, but he lectured to club members as though he’d scored big time for years. Really, Gibson has had to teach himself. As a high-school student he and his friends would start a project, usually fail, scrap the whole thing, and then start another. He likes to say, “I know every way to fail.” It’s a learn-by-doing approach that seems to resonate with all the club members, who have help from the school’s faculty but are usually blindly teaching themselves how to build games and sell their ideas. “What I heard overwhelmingly is that people wanted to make their own games without too many strings attached,” Gibson told New Times. The easiest design mantra, club members think, is, “It’s like this but with this.” At the meeting Gibson threw out the example. “It’s like Oregon Trail but with zombies.” A girl in the front row squeaked and giggled and there was a collective hush when they all realized it wasn’t a bad idea. They got off the pioneer-zombie track quickly and broke into small groups. Within about a half hour groups presented their game ideas, which were really intriguing. In one group, Kevin Whipp and Bob Somers eagerly tried to snag new team members for their Half Life 2 capture-the-flag mod, “Construct.” They’d already built an early version of the game, but were losing team members to big game studios; among them their 3D artist who got scooped up by Volition. Another team pitched a game in which the player could jump between various floating planets, each of which had its own gravity field that would affect everything from the player to the bullets being fired. There was a team pitching a Rube Goldberg-style puzzle game in which the player could manipulate physics, friction, and even time. Staff Writer Colin Rigley’s Xbox gamertag is Puppy Sparkles—bring it. He can be reached at crigley@newtimesslo.com.